This is a rather straightforward post. Our lab is doing research on music taste and one of our projects involves sampling songs from the Billboard Hot 100. It tracks the singles that made it to the #1 in the charts in the US (and for how long they were on top), going back to 1940. Musical diversity over time. Note that the data was smoothed by a 3-year moving average. A value of just above 10 in the early 40s means that an average song was on top of the charts for over 4 weeks in a row. The peak levels in the mid-70s mean that the average song was only on top of the charts for little more than a week during that period. 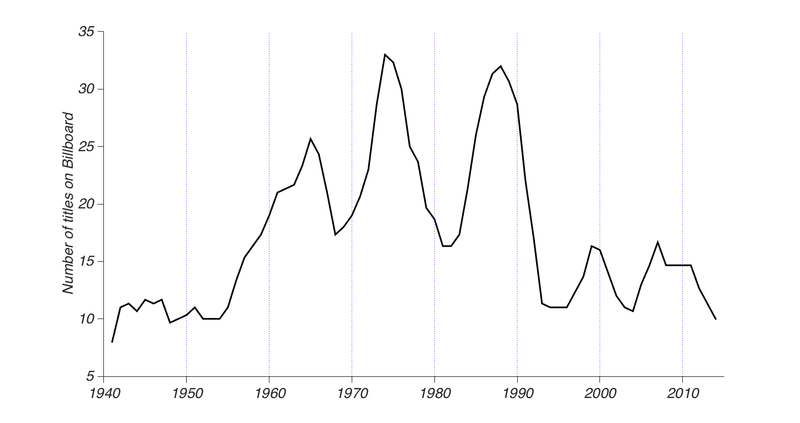 Basically, diversity ramped up soon after the introduction of the BillBoard charts, and then had distinct peaks in the mid-1960s, mid-1970s and late 1980s. The late 1990s peak is already much diminished, ushering in the current era of the unquestioned dominance of Taylor Swift, Katy Perry, Rihanna and the like. Perhaps this flowering of peak diversity in the 1970s, 1980s and 1990s accounts for the distinct sound that we associate with these decades? Now, it would of course be interesting to see what drives this development. Perhaps generational or cohort effects involving the proportion of youths in the population at a given time? Note 1: “Diversity” as literally “number of different songs over a given time period”. The temporal difference density. It is quite possible that these “different” songs are actually quite similar, but there is no clear metric by which to compare songs or a canonical space in which to compare them. Pandora has data on this, but they are proprietary. So if you prefer “annual turnover rate”, it would probably be more precise. Note 2: My working hypothesis as to what drives these dynamics (that are notable phase-locked to decade) is some kind of overexposure effect. A new style comes about that coalesces at some point. Then, a dominant player emerges, until people get bored of the entire style, which starts the cycle afresh. A paradigmatic case as to how decade-specific the popularity of music is would be Phil Collins. Note 3: Similarity of music might be hard to quantify objectively. Lots of things sound similar to each other, e.g. the background beat/subsound in Blank space and the background beat/subsound in the Limitless soundtrack. This entry was posted in Science, Social commentary. Bookmark the permalink. Did you do a Fourier transformation? Or better: When is this going to change!!! How about plotting an artist (as opposed to song) diversity curve too? Would be cool to check out and compare..
That is a plausible hypothesis but why would the cycle take as long as a decade? I suggest the decadal cycle is the result of the aging of a particular audience cohort and being replaced by a new cohort with altered tastes. I found this very interesting and it opens up many more interesting questions. Before the 90’s music was much more tribal with a few large groupings that blended fashion with music (mods, rockers, punks, disco etc.). The means of music distribution was limited compared to today – radio and TV(which predominately focussed on playing the hits), concerts and buying or listening to records bought from shops. Discovering and listening to alternative styles of music was much more difficult than today and was usually reflected by album purchases (which were not counted in the Billboard Top 100). Now with music distributed digitally it has opened up a much larger listening and buying audience and made it far easier to discover and listen to more diverse music. So if you have a much larger population with easier access to more diverse music why is the diversity of the Billboard Top 100 decreasing ? Has this decreased the relevance of the the Billboard Top 100 to the overall diversity of the listening populations tastes ? Sales required to get into the Top 100 has actually decreased considerably since the 90’s. Does this mean that the Top 100 now reflects the listening preferences of a smaller percentage of the overall population ? Does music production technology now make it easier to make songs that simply ride the wave of any surges in popularity of a particular style? 1. When were Billboard Policy changes made ? 2. What were the total sales volumes represented by Top 100 ? 3. When were different means of distribution made – Vinyl, CD’s MP3’s, Streaming etc.. It happened 41 years and 7 days ago. It will happen in 80 years, 8 months, and 7 days.